Sarah Ann writes A Prayer for Martyr Mom Attitude. Ashley shares How to Pray for Your Husband. Kira asks Are You Using Your Talents Well? Kari says Want to Like Other Parents? Assume Positive Intent. Want to celebrate Presidents’ Day with your kids? Sarah has 16 Frugal Presidents’ Day Crafts, Facts, and Recipes. Podcast to share: The Happy Hour with Jamie Ivey, Episode 125: Renee Swope. About halfway through this interview, Renee begins talking about a struggle she and her husband went through with their teenage son. I thought she shared some really helpful insights for parents of teens. 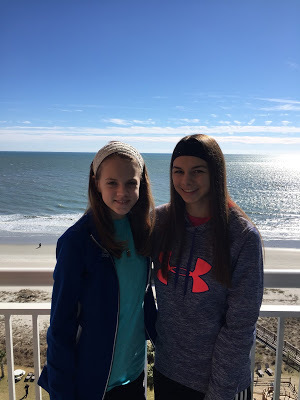 We got away to Myrtle Beach last weekend for some good family time! You're welcome! 🙂 Have a great weekend!! I really enjoyed the post about praying for my husband. I try to pray for him daily, but I don't always know what to pray, so that link was helpful. I also enjoyed the one about positive intent. Too often, I assume the worst, and I have to try to counter that with the positive. Wow – martyr mom attitude: I have been known to suffer from this one!!! I also loved the cues re: praying for my husband. I need to be more intentional & specific.